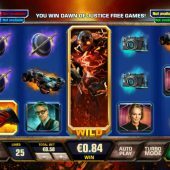 Batman v Superman Dawn of Justice slot is certainly a spectacular looking DC Comics game with the superheroes standing either side of the reels over a burning metropolis as they prepare to do battle, not against evil but with each other for a change - but don't worry, only as Wilds! Dramatic music and effects compound the theme with some great graphics and you do immediately feel immersed in the game, which is far superior to its sister slot Batman Begins and possibly the Superman The Movie edition too. The real enemies of both are the villains on the reels, but could it cost your bankroll dearly to see them defeated? We start with 25 paylines on 5 reels of 3 rows each and the icons are all single or double stacked bar the Dawn of Justice Wild on reel 3, but we'll visit that later. You have two different Wilds for a start and a female heroine joins the Batman and Superman Wilds in the bonus to make three, but any combination will award a decent 50x bet for a 5-of-a-kind line as will the Superman icon too. The other three characters pay 16, 12 and 8x respectively with the six minor symbols including a camera, newspaper and Batmobile awarding between 2 and 1 x your 25-coin stake. The Batman and Superman Wilds in the base game transfer across the reels until they disappear, Batman going right and Superman left. Just as in Netent's The Invisible Man, if these cross over on the same row they will trigger an unlimited free spins bonus. During these free games they will clash again no doubt, and when they do you choose a winner and then they go toe-to-toe with each other awarding extra spins if your choice ends up victorious although some random extra Wilds will be awarded either way. You may end up with some decent wins as there can be several Wilds in view simultaneously. The fiery Doomsday stacked Wild may fill reel 3 up and when he does a roar and ball of flame ensues and he gets pushed to reel 5. Each free game he advances leftwards one reel a spin, but should any hero (and now with added heroine!) Wild appear to his left anywhere in view, Doomsday is pushed forcefully back to reel 5 to begin his journey again. Once he does reach reel 1 thus meaning one final spin, he will roar and explode his fiery fury to cover reel 2 as well for that grand finale spin!